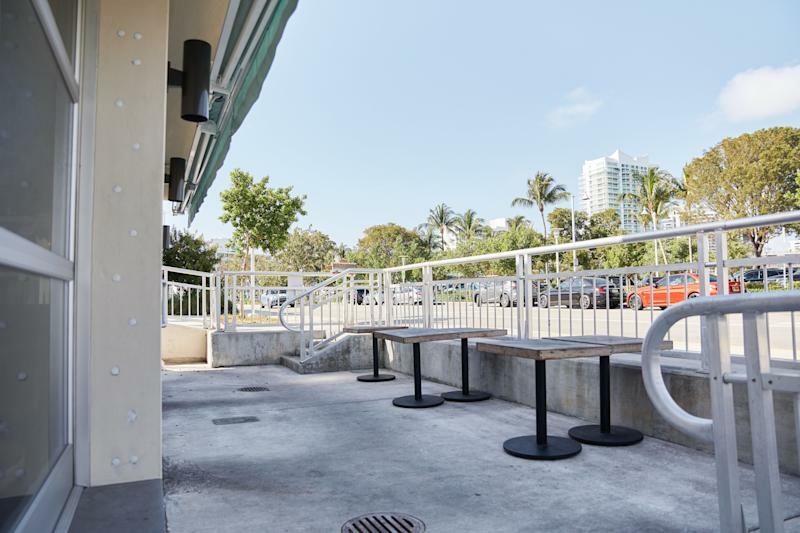 MIAMI BEACH — Harold Wanless sits on a bench in Maurice Gibb Memorial Park beside a new concrete sea wall, the sound of hammers and drills emanating from Belle Isle across a cloudy, turquoise inlet of Biscayne Bay. Knowing what he does about how fast the water surrounding these porous barrier islands is rising, Wanless, director of the University of Miami’s geological sciences department and a leading expert on sea level rise, marvels at the level of denial the latest building boom requires. Named after the Bee Gees bass player and keyboardist who lived the later years of his life in Miami Beach before his death there in 2003, the park is in Sunset Harbor, a neighborhood the city set about lifting 2 feet after regular flooding brought on by sea level rise made it increasingly uninhabitable. To Wanless, that amounted to little more than a short-term fix. “With another 2 feet of sea level rise, I don’t think any of these barrier islands are inhabitable in the normal sense that we live on them today,” Wanless says. Having spent nearly six decades studying the geologic impacts of rising seas on global coastlines since the last Ice Age, Wanless can foresee the disaster that will overtake his city as surely as critics predicted the death of the cocaine-fueled disco era 40 years ago. Of late, what worries Wanless most are the “21 climate change feedback loops” that he says are now accelerating the melting of glaciers and the polar ice sheet. Those processes — such as the recent finding that more frequent rain in Greenland has doubled the rate the continent now contributes to sea level rise — have made Wanless increasingly pessimistic about South Florida’s future. “With sea levels rising at over a foot per decade, it’s over,” Wanless, who owns a home in nearby Coral Gables, says as he glances at a trio of passing jet skiers. Miami Beach’s existential math problem is all too easy to understand. On the bay side of the island, the elevation averages just 2.4 feet above sea level. Higher ground, 11.41 feet, is found along the island’s famous beachhead, where 9.2 million tourists flock annually to party like there’s no tomorrow. The initial $500 million solution for Sunset Harbor and other low-lying sections now serves as a template for other parts of the city: Raise roads up to 2 feet, increase the height of the sea wall on city-owned shoreline, require new private construction to be one foot above base flood elevation and install permanent hydraulic pumping stations to protect existing buildings from flooding. That investment is just the start of what will likely be a multi-stage effort to buttress Miami Beach from the coming onslaught. Gelber, whose father is former Miami Beach Mayor Seymour Gelber, has taken on his share of challenging jobs over the course of his career. A former prosecutor, he led the U.S. Senate investigation into the 1995 bombing of the Alfred P. Murrah Federal Building in Oklahoma City, Okla. After stints in the Florida House of Representatives and the Florida Senate, Gelber ran for state attorney general in 2010, losing to Pam Bondi. Seven years later, he was elected mayor of Miami Beach, a city that had already begun spending millions to fortify itself from the rising sea. “These streets are all going to go under another transformation in the next 80 years — it may be a couple different transformations — so this will be a constant thing we’ll be addressing, like a lot of coastal communities,” Gelber says. On the short drive from Sunset Harbor to North Bay Road, a well-to-do, flood-prone enclave, for-sale signs dot the landscape. Last year, after learning that the city planned to raise the street 2 feet, many residents on North Bay Road rebelled, and now the project is on hold. 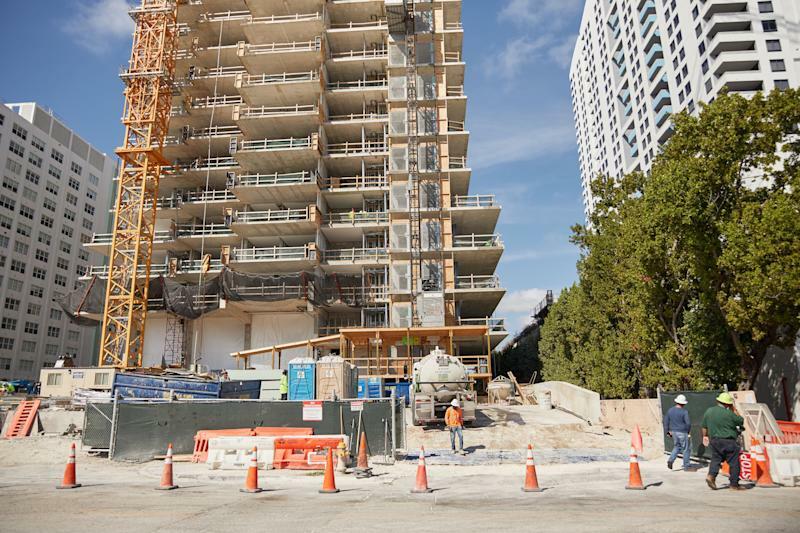 Jean Marie Echemendia, a realtor at Douglas Elliman who splits her time between Manhattan and Miami Beach and owns two houses on the street, opposes the construction. 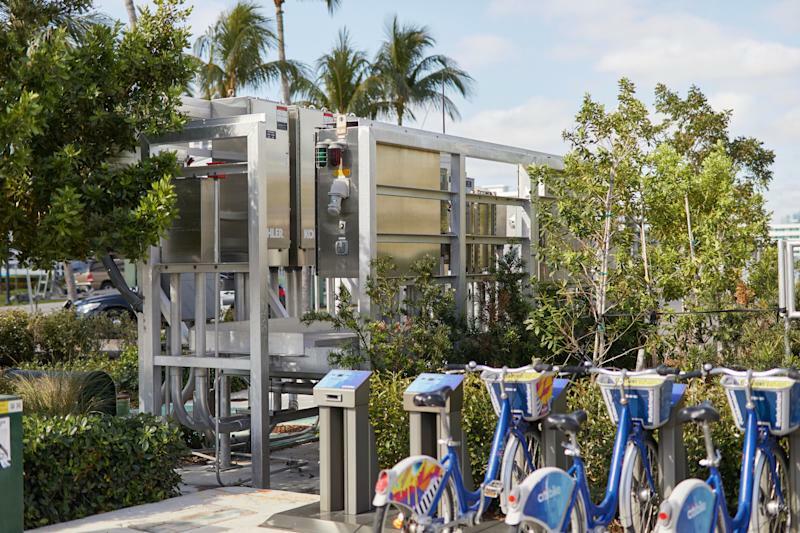 Gelber contends that the installation of more pumps will take care of that problem and that homes and businesses at the original grade can connect to the hydraulic network for free. Making that case to the city’s skeptical residents, however, has become a big part of his job. While Echemendia believes in climate change — she notes that she has purchased two Teslas to cut her carbon footprint — she also thinks that worries over sea level rise are overblown. She was among the residents who pushed back on the two-tiered plan. “Am I afraid that water is going to totally engulf our streets like they’re picturing? No, I’m not. I don’t think it’s going to be in our lifetime,” Echmendia says. The Union of Concerned Scientists, among others, disagree. 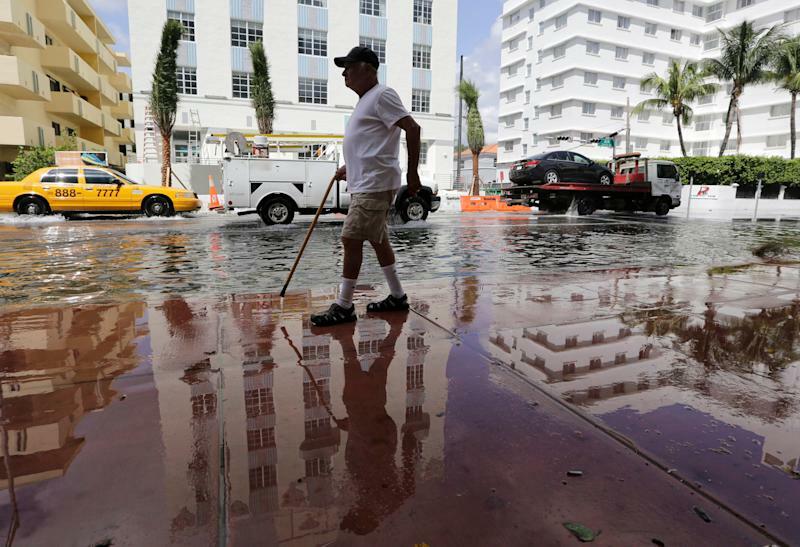 In a 2018 study the group found that flooding exacerbated by sea level rise will, by the year 2045, threaten 12,095 homes in Miami Beach valued at $6.4 billion. By the end of the century, nationwide losses are projected to top $1 trillion, including damage to an estimated 2.4 million homes. With the scale of the coming disruption almost too large to comprehend, NOAA has built a website that lets users glimpse the inundated future on coastal maps and toggle up a dystopian amount of sea level rise. For Miami Beach, just 2 additional feet subsumes much of the west side of the island, including North Bay Road. Add another 4 feet and all but a sliver of the land where the city’s art deco masterpieces were built is covered in blue. Doing nothing on North Bay Road is already problematic. “It floods just about every time it rains,” Kimberley Green, president of the Green Foundation, a nonprofit dedicated to improving global health care services to the poor, says from the front steps of her single-story home. While Green says she isn’t sure what will happen if the city raises the level of her street, she is decidedly sour about what she has already seen. “I was a property owner in the Sunset Harbor area, and my family owns some of the retail property there and it [raising the streets] destroyed all of the businesses,” Green says. When asked whether any of her neighbors support the plain to raise the road, she gestures across the street to a fenced-off bay front lot with a for sale sign planted out front and says it once belonged to Colombian cocaine kingpin Pablo Escobar, a real-life “Scarface” whose property went derelict after his 1993 death in Medellín in a shootout with Colombian police. “But that’s a whole other crazy Miami Beach story,” Green says. But everyone seems to understand that much, much more will be needed in the coming decades. While money isn’t the most pressing problem for now, what will happen when more banks decide 30-year mortgages are too risky for the island? What if government sea level rise projections are too conservative, as the 21 feedback loops Wanless cites seem to suggest? Even if Washington politicians surprise the world by finding common ground on climate change, 90 percent of global temperature rise since the Industrial Revolution has been stored in the world’s oceans, meaning sea level rise will continue unabated even if carbon emissions are miraculously slowed or reversed. 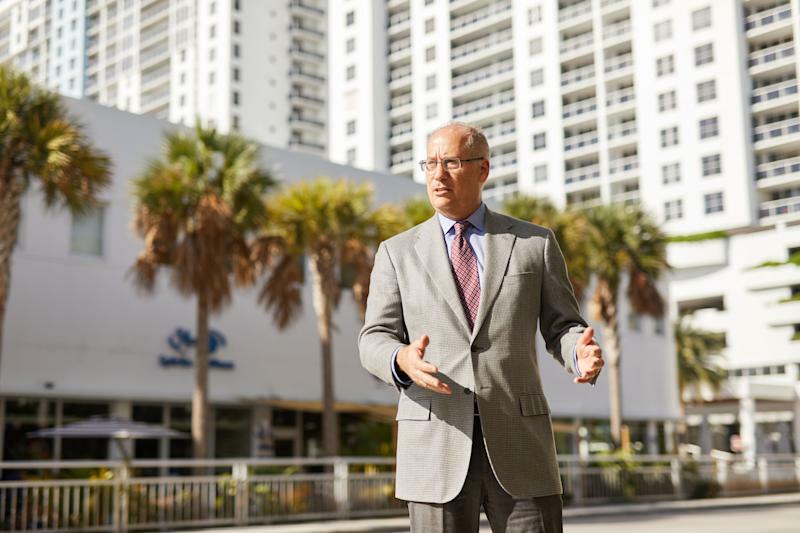 For his part, Gelber is doing his best to assure the public that investing in Miami Beach still makes sense. Back at Maurice Gibb Memorial Park, the sun is out and the grass is dry. Biscayne Bay still has another few feet to rise before it will top the aptly named Venetian Way Bridge that leads to Belle Isle and its luxury condos. 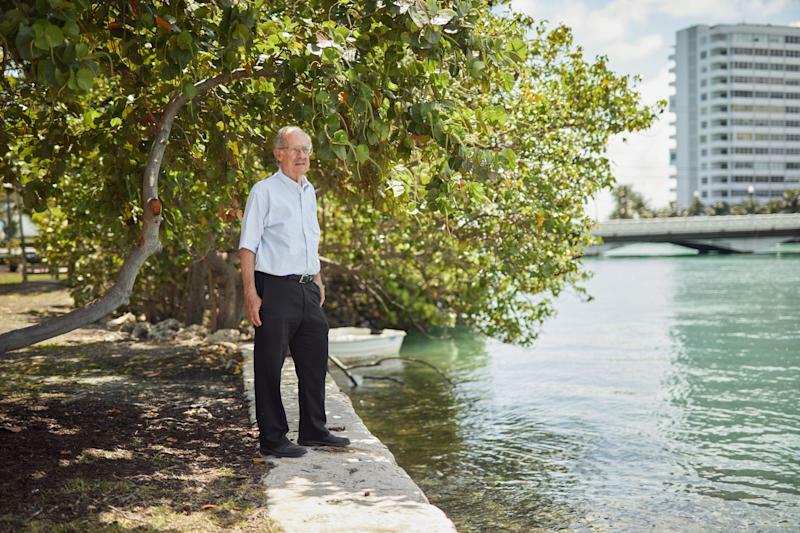 Nearing retirement, Wanless still hopes that the world will wake up to the fact that sea level rise isn’t some problem for generations not yet born. He closes with an anecdote that you certainly won’t find on a brochure at the Miami Beach Chamber of Commerce. “I had a Wall Street triathlete call me and ask, ‘Can I get 10 years out of a condo on Miami Beach?’ I said, Eh, probably. If you’re going to do it for 30 years, I’d be very careful,” Wanless says.